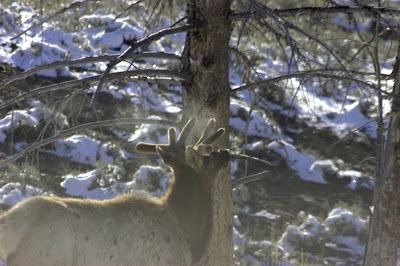 After seeing the bison and calves we spotted 4-5 bull elk in velvet. In this pic you can see the steam rising from his nose. Just after I took this pic they all took off running. Perhaps a wolf or they were just trying to warm up it was just 20F. 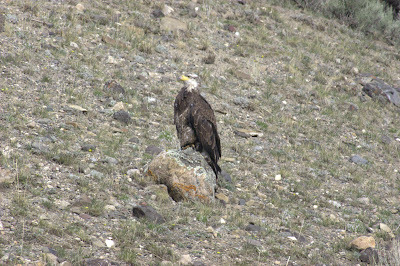 Leaving Mammoth Hot Springs we spotted this Bald Eagle just hanging out on a rock. After the morning fun, we collected bulk soils from the remnant (although invaded) never tilled site and the invaded previously tilled site. We are testing a method to quantify denitrification, the loss of soil nitrogen through the production of gaseous forms of nitrogen. In the pic below the soils (in aluminum pans) are being treated with either water, ammonium nitrate, or urea. You can also see the flasks that have soil in them for determining soil respiration and microbial biomass. The early results are interesting, stay tuned. Below you can see the 6 inch PVC pipe chambers that we are using for the denitrification experiment. In between the tubes on the top is a "tube" that quantifies NO gas which is a by-product of denitrification. If this method works well and we have good weather we will take it to the field.